The V-Neck Sweater is an essential because you’re going to need warm layering pieces for the cooler parts of the year and it allows you to mix and match your Essential Wardrobe a little better by layering it with a blazer or suit, over an oxford or semi-spread collar dress shirt and paired with simple dark wash jeans or wool trousers and a white sneaker, boots or oxford dress shoes. So how could I leave it off this list? Why a V-Neck and Not a Crew Neck? Crewnecks are okay, but they’re a more casual item. So for this reason, a V-Neck sweater is essential because it’s the classy mofo of the sweater world. 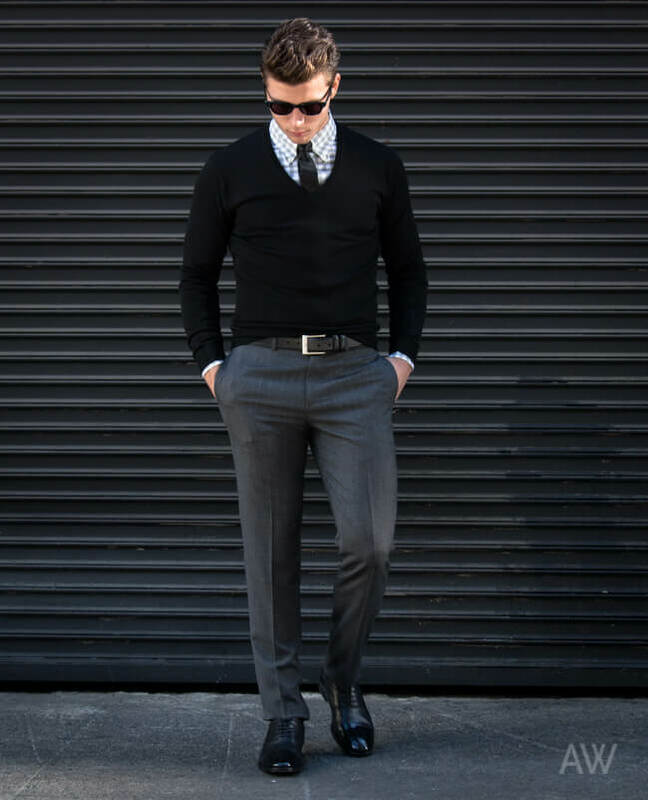 V-necks add a touch of dressy formality that you just won’t get with a crewneck. I love crewnecks, don’t get me wrong, but most guys don’t know how to wear them so then it starts looking really sloppy. I know some guys like the crew neck and tie or suit look, but I would choose a v-neck or cardigan sweater over a crewneck in this case almost every time. Wear them without any shirt underneath – gross! I prefer the V-Neck Sweaters I work with to be made of wool, – either regular or merino wool. Cashmere is also a great fabric, but it’s definitely on the pricier side. If you run a little warmer, then go for a wool/silk or cotton-blended sweater – Pima cotton is also great, but it stretches out very easily. You need at least 1 black V-Neck Sweater in your closet. If you’ve got a black one already, grab a navy and/or charcoal gray version. These colors will go with everything else in your Essential Wardrobe. If you want a 3rd option, then a darker brown will also go pretty well with your wardrobe, too. How Should a V-Neck Sweater Fit on a guy? 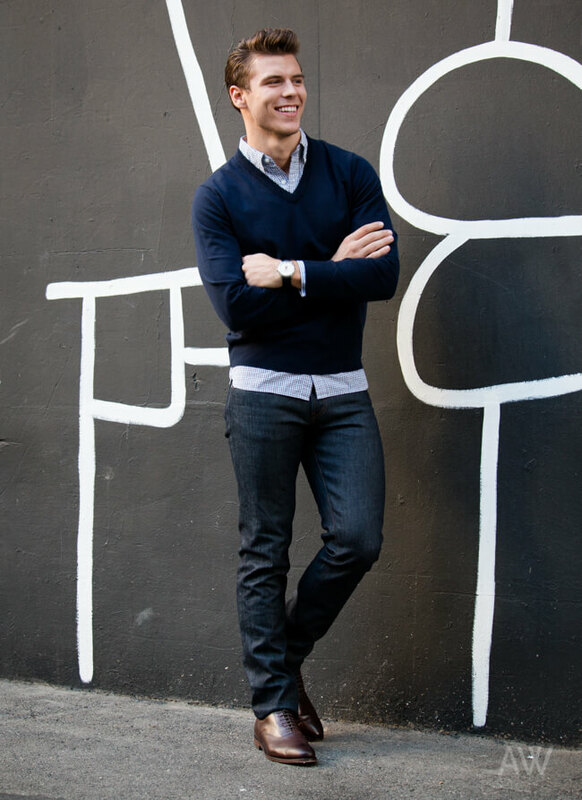 Check out my V-Neck Sweater fit guide for how (all) your sweater(s) should fit. I love these because the fit, fabric weight, and overall construction is impeccable and I’ve worked with these brands many, many times. I love each one of these v-neck sweaters, especially the H&M and Life After Denim sweaters. Even though they’re budget-friendly, the quality, fabric weight, and overall fit is really good. If you live in a climate where the temperatures drop during the winter, you’re going to need a coat or two. So let’s talk about Overcoats & Peacoats. They’re not to be confused with a jacket or windbreaker or whatever other sorry excuse for a coat I see guys wearing during the winter months. You need a proper coat that’ll look sharp and timeless and last many, many seasons. Your coat is the first thing anyone is going to see (aside from your shoes and a scarf) during the winter months, so let’s make sure you look amazing. In my travels, I see a lot of Overcoat blunders, so let me go over the common mistakes I see guys making with their coats before we dig in. This makes stocky men look really wide and/or short and thin guys look even thinner. This would technically fall under fit, but it’s such a big problem that it deserves it’s own section. Your overcoat is designed to go over your clothing, not be a blanket you threw over yourself! The worst is when I see guy’s sleeves going past the beginnings of their palms or their coats hitting mid-shin. If a coat goes past your knees, it’s going to collect dirt, mud and salt stains on the bottom – gross! Some of my male friends suffer from this: They just have too much stuff going on with their coats. As I mentioned in my first #AskAW episode, you don’t need epaulettes/shoulder straps, sewn in sweaters or hoodies or a bunch of pockets or zippers or… things hanging off your coat. It looks cheap and tacky. Even though I work in the fashion industry and attend the various Fashion Weeks around the world, good lord, there’s some jackets I see guys wearing on the street and I just wonder what happens once it goes out of style in a few weeks. I would never recommend something trendy as a Men’s Wardrobe Essential because you’ll probably only get one winter’s worth of wear out of it. If you live in a warmer climate and are wearing a long overcoat without a suit, you look silly. There’s a time and a place for everything and it’s important to understand this in all things, but definitely in regards to coats. See below for details on when it is or isn’t appropriate to wear your coat. For more style mistakes, check out my free “10 Most Overlooked Men’s Style Mistakes” and how to fix them ebook. What Coat(s) Should Men Own? A man should own at least one of these two coats, maybe both. See below to determine whether you need one or both coats in your closet. An overcoat is an essential if it snows where you live because it’ll cover more of your body and be a great coat to layer clothing under to keep warm on the colder days. Do you wear suits often? If you wear suits (like a gray suit), regardless of your climate, you need an overcoat because this is the only coat that compliments a suit. 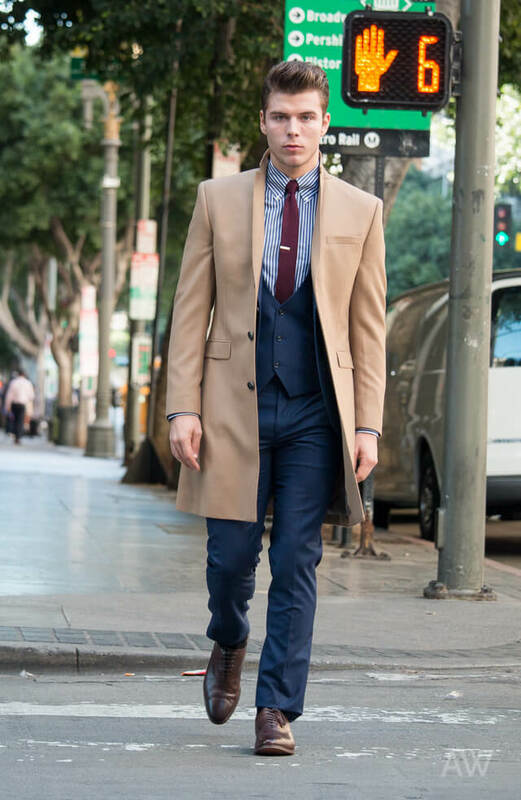 A Peacoat won’t work with a suit because (if it fits properly) it’s too short to cover a blazer or suit jacket as well as too casual for this type of outfit. Every guy, regardless of his climate or whether he wears suits regularly or not, should own a Peacoat because it’s great for casual outfits in your Essential Wardrobe. If you live in a colder climate, it’s also great for warmer winter days and through the early parts of Spring. Notice I’m leaving out Fall. This is because that’s when a Blazer, Leather Jacket and Harrington Jacket really shine. 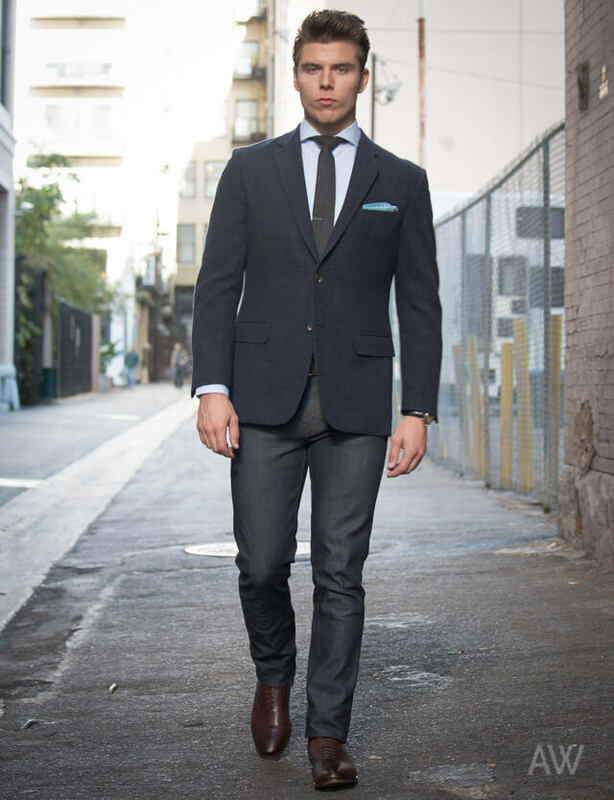 For moderate/warmer climates, like Southern California, a Peacoat will be your “winter” coat. A proper Peacoat is always double-breasted, so that’s not an issue. As for Overcoats, stick to a single breasted coat because a double breasted Overcoat would require you to wear it buttoned 24/7 since it looks really big and floppy when it’s left unbuttoned. Single breasted gives you the option to wear it buttoned or unbuttoned while still looking sharp and form-fitting. For Peacoats, you want to go with the classic Navy color. For Overcoats, you can go with Navy, Camel (tan), Black or Dark Gray. If this is your first Overcoat, go with Dark Gray or Black. If it’s your second, get a Camel Overcoat to inject some color into your wardrobe, as it’s still a neutral color that will go with the rest of the Men’s Wardrobe Essentials. How Should An Overcoat or Peacoat fit? Check out my Overcoat & Peacoat fit guide for how a man’s coats should fit. I chose these coats because they all have a great tailored fit and the material, coat length, lapel width, buttons and the overall construction of them is impeccable. 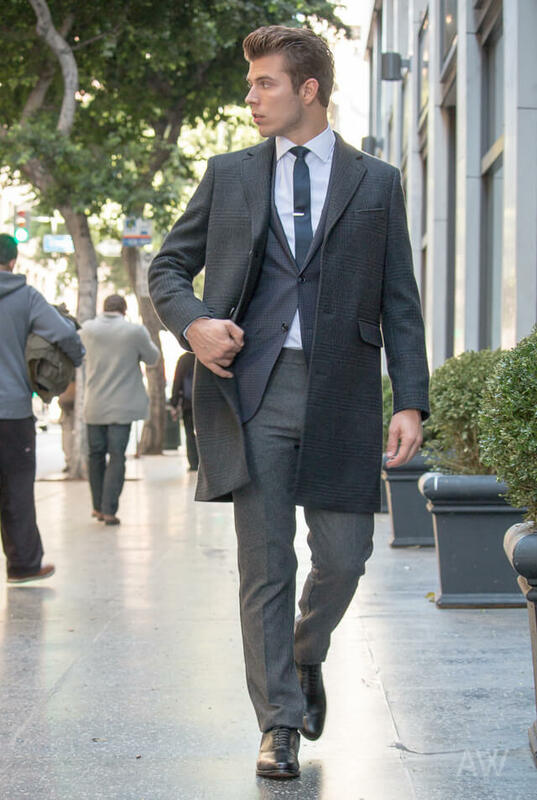 I love the Brooks Brothers charcoal Overcoat, which I actually used on a recent shoot with Harrison Ford, and I was amazed at how well-designed this coat was. The Burberry and Billy Reid Peacoats are my favorite Peacoats of all time! The details are incredible and they’re flattering on every man. An interesting fact: The Billy Reid coat is named the “Bond” coat because it’s the exact one Daniel Craig wore in “Skyfall.” The Burberry runs on the slimmer and slightly longer side, so if you have a shorter and wider build, then this may not work for you, although my model (below) was wearing it and he was quite “built”, so YMMV (your mileage may vary). Each of these coats has a simple and clean design with no unnecessary flourishes, which you’ll usually find with cheaper alternatives. The price point is great for these considering they’re wool and wool-blended coats and will keep you warm and looking sharp. I love the Topman Camel Overcoat a lot, which is why I used it on my model below! 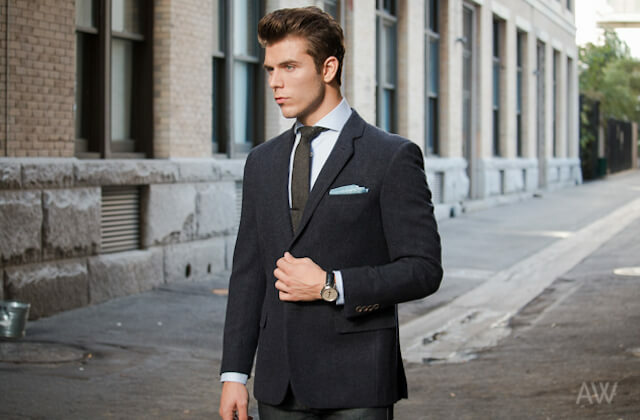 Q: How should a sport coat look and fit? Q: How do I dress in a more “mature” style that makes me look my age? See my Men’s Wardrobe Essentials articles for the clothing you should be wearing to look more mature. Also, see my Men’s Clothing Fit Guide for how each of these items should fit, regardless of your age or body type. Q: Looking to replace my worn-out wingtips with black cap-toe Oxfords or should I keep them and get Oxblood Oxfords, instead? I’ve seen so many articles and videos taking how to get the proper dress shoe fit that are completely unnecessary and just create more useless work and steps for the poor readers. Of course, if you ask a shoemaker or shoe salesperson about what goes into fitting for a pair of dress shoes, they’ll tell you about the painstaking process you must endure as they pull out their Brannock device and start measuring the length of every toe hair in relation to the current barometric pressure. As someone who dresses and fits men for shoes as part of my career, it’s all hogwash. Never once, in all my years, with all my clients, have I ever needed to get an exact measurement of their feet – and this is because the brands and manufacturers don’t work this way. Their sizes aren’t universal and can vary wildly between brands. So a 9 in one brand might fit the same as a 10.5 in another brand. Each one is different, so it’s great that you know your right foot is 10.236 inches long by 4.789 inches wide, but that really doesn’t matter unless you’re getting custom made shoes. So what you have to do is try on dress shoes and figure out how to get the best fit in that style/brand. Let me show you how. You should know and do these few things before trying on dress shoes. I’m assuming you’ve worn shoes before and have a general idea of your size? Great! That’s all you need. Like I said earlier, since each manufacturer has different fits and sizing for their shoes, it’ll all be trial and error anyways. The thing you want to do is get in the ballpark and use that as a starting point. If they don’t, they’ll never fit. Leather, especially in dress shoes, will stretch very, very little, so “working in” a pair of dress shoes is not going to happen and will be a waste of your time and money. One of the worst things ever is wearing a pair of uncomfortable shoes – as a woman, I know this all too well! So, if you can, try on shoes in the afternoon. This way, you’ll get the most realistic size and fit of the shoes. Make sure the shoes fit your larger foot first, not the smaller one. Slightly too big is not uncomfortable, slightly too small is very uncomfortable. When you’re trying on shoes, here’s the things to do and look out for. Wear the type of socks that you will normally wear with these shoes. In other words, don’t wear your thick woolen socks, or your super thin ankle socks when trying on dress shoes. If you feel ANY bunching in the toes or feel the shoe pressing against any of your toenails, they’re too short. I see some places talking about your toes grazing the front of dress shoes – this is not correct. Your feet shouldn’t be touching or grazing anything in the front. If they’re grazing, that means when you walk, your toes will be jammed into the front of the shoe, because your feet will shift slightly forward as you walk, which is very uncomfortable. Either go up a half size and if that doesn’t fix the problem, it might be a style or width issue. So try a different style or a different brand that makes the same style. Luckily, with dress shoes, they’re pretty darn similar, so you’ll find an equally great one, I promise. The shoe should not be putting any pressure or squeezing on the sides of your foot – anywhere. If you feel anything like that, you may need to go up half a size and see if that fixes the issue. If it doesn’t, you can see if they make a wider size in the same style. If they don’t, then try a different style or brand. Some brands are wider than others. On the flip side side of that, you also shouldn’t have any room on either side of your foot that allows your foot to move left or right when it’s laced up. If this happens, go down half a size and see if that fixes the issue. If not, you can ask if they have a narrower width in this shoe. If not, you may need to try a different style or brand. The average man has a medium width of D. If a brand doesn’t specify a width, which most of them don’t, this is probably the width they use. Again, though, a brand’s definition of a D width varies, so watch out for the differences. A narrow width is a B, a wide width is E and an x-wide width is 3E. If your foot falls between a B and a D, go with the larger width. I see some places saying that if they’re lace-up shoes, like an Oxford Dress Shoe (Which they almost always should be, if they’re dress shoes! ), you should not be able to tie the laces so tightly that the two edges of the shoe meet. I don’t adhere to this advice because some of my clients just have less meat than others on the tops/profile of their feet and when this happens, it’s not a problem. As long as the shoe fits everywhere else, I wouldn’t about this part. If you have the width and length in check, this shouldn’t be an issue, but just in case: You want a little bit of space between your heel and the shoe, but not too much. My one finger test for sneakers is not applicable here. They should fit a little snugger than tennis shoes do in the heel, but should not be pressing against your heel as to be uncomfortable. Lace up both shoes and take a short walk in them. There should be little to no slippage in the heel. If there is, they’ll create blisters on your heel and that’s not fun. Also, since I hear this complaint a lot from guys – If there’s anything like a seam or stitching rubbing against your heel, don’t get those shoes. This is mostly typical in cheaper shoes. This area will never “break in”, so if something is rubbing against your heel when trying them on, it’ll never go away, so stay far away from them unless you like blisters on your heels! 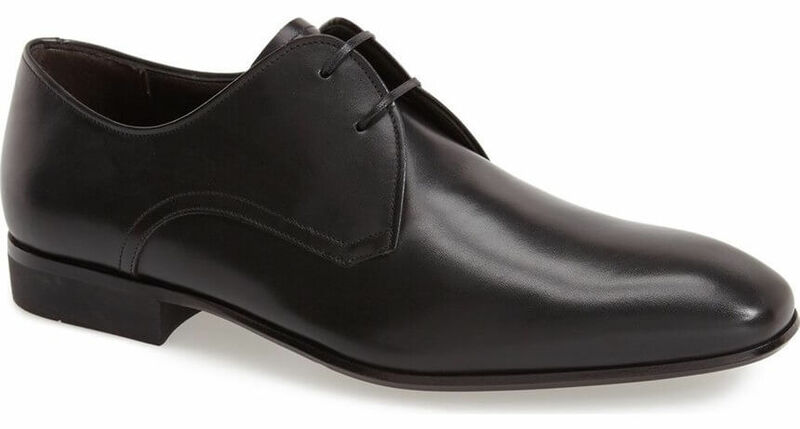 See my Men’s Wardrobe Essentials – The Oxford Dress Shoe for my picks.